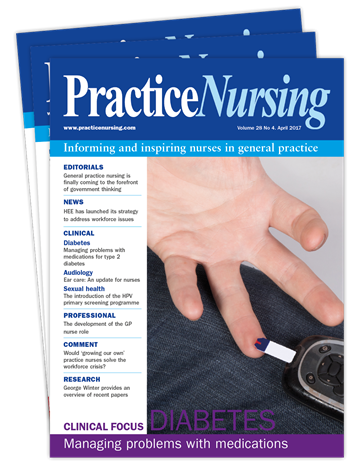 Practice Nursing provides nurses working in general practice with the tools to reach their full potential and deliver the best possible care to their patients. 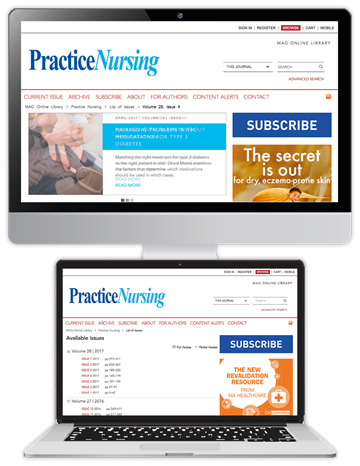 The journal informs and inspires by providing relevant, evidence-based clinical articles, highlighting key professional issues and promoting the latest nurse-led research. diabetes, resipratory diseases, vaccination and travel health. findings published elsewhere, that could have implications for practice. expert advice and mentorship from your fellow practitioners. is always based on the best available evidence. evaluate your skills, and meet your CPD requirements. deliver, high-quality, person-centred care to your patients. allowing readers to review and improve their communication technique. Save 10% when you subscribe today, and receive the journal and your free gift from just £1.96 per week. To claim this offer, please select your appropriate subscription option below, and quote coupon code PNN18C when prompted at the checkout.